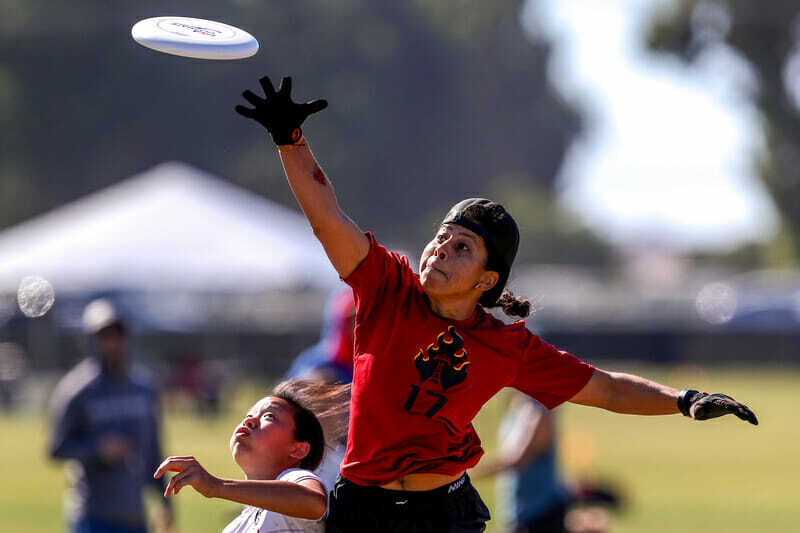 DEL MAR, CA—Riot and Scandal were the marquee matchup in the women’s division quarterfinal round, which followed a thrilling prequarter round of dramatic games. The quarterfinals mostly didn’t live up to that bar. Here’s the rundown of the women’s quarterfinal round. Even before facing off at Nationals in quarters, Brute Squad and the 6ixers were intimately aware of their opponents. The teams had played a total of three games against each other in the past four months and knew their matchups before the first pull went off. Here at Nationals, with the stakes at their highest, Brute Squad took care of business and put away the younger roster to reach semis. Both teams went into the game knowing how high the stakes were, although 6ixers obviously went in a little more fatigued, having just beaten Rival in a closely contested game. At the start of the game, this seemed to work in their favor, as they broke Brute Squad on the first point of the game to take an early lead. It would not last, though. Boston’s defense, which has largely been viewed as the best in the nation, came through time and again with clutch blocks. By the ninth point of the game, Boston had already taken a commanding 6-3 lead. To give 6ixers credit, they also played impressive defense early on, and forced Brute Squad out of their comfort zone by throwing a number of varying zone looks. And yet, even when the 6ixers could cause the turn, Brute Squad would buckle down and earn the disc back. The 6ixers had their break chances, just not a lot of them. In many ways, the biggest problem for Toronto was trying to contain Kami Groom. No other player put the 6ixers through the ringer quite like Groom. She would take the toughest assignments downfield and then immediately tear down the field to the end zone once Brute Squad got the disc. Not only was she able to contain her mark, she exhausted them throughout the course of a point. Cat Philips and Lauren Kimura both worked their hardest to keep Toronto in contention, but the Boston defense was too great to overcome. Groom wasn’t the only standout defender, either. Tulsa Douglas invited her in-region opponents to a block party in the quarterfinals, recording four blocks of her own and being responsible for a number of rushed throws. She was particularly effective close to the end zone. There were a number of times where it seemed as if Toronto was going to punch in a quick goal, only to be stifled in their efforts. Ultimately, despite keeping the game close in the first half, Toronto just didn’t have the firepower to overcome Boston. They were broken five times in the second half and looked exhausted by the end. Kami Groom closed out the game with a speedy cut into the end zone that her defender never stood a chance of stopping. Boston may have won this bout but there is hope for Toronto. They are still a very young team and are developing at an impressive pace. “It’s definitely an accomplishment to make it here and we played the highest level game we ever have against them,” said Kimura. While this may be the highest level they have played against Boston currently, it’s likely that they’ll continue to see the margin shrink between their own squad and Brute’s. 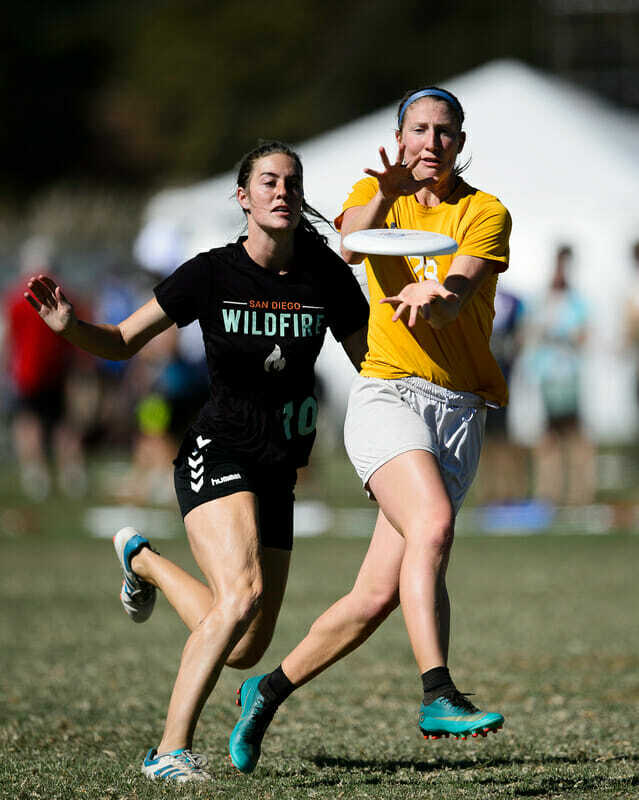 While most of the women’s quarterfinal games included two top seeds playing each other, the game between Wildfire and Fury was a breath of fresh air. Wildfire entered the tournament as the no. 16 seed after only earning a single victory over any of the other Nationals qualifying teams. Their streak of good games that led them all the way to quarterfinals largely overshadowed the impactful loss they suffered at the hands of Fury. On day one of Nationals, Wildfire lost a close game against Scandal, and got blown out by Molly Brown. Neither game was the focal point for the team. They knew there was only one game they had to win to make the bracket. “Our focus was to make it out of pool play,” said Wildfire captain Lindsay Lang, “and that meant beating Nemesis.” By now, their win over Nemesis is well known. Their victory over Schwas is another story. Meeting Schwa during prequarter was a dream come true for Wildfire. Schwa was the only Nationals-bound team that Wildfire had defeated in the regular season, so the team knew they could win. To Schwa’s credit, the game was close the entire way through, and neither side seemed more deserving than the other. It was Wildfire and their defense that won out the game, though. Schwa was up late in the game but couldn’t find that last bit of reserve to make it past the home team. This set Wildfire up for their game against Fury, which had already been played out once before at Regionals. That game had been decided by strong defensive efforts from both sides, before ending in Fury’s favor, 11-5. But on the biggest stage, and with the cameras rolling, Wildfire’s game against Fury turned into a shootout. Fury’s aggressive offense worked for them time and again in the first half. By the seventh point, Fury had taken a commanding 6-1 lead, and showed no signs of slowing. Most of the time it was Marika Austin leading the charge downfield. She ended the game with three goals, most coming off of successful deep cuts. Wildfire may have been mostly outclassed in the first half, but their bright light in the storm was Dena Elimelech. For all of Fury’s talent, they didn’t seem to have a single player that could stop Elimelech when she went deep. Too often players like Cree Howard and Claire McKeever found themselves beaten in the air by Elimelech’s untouchable height and field awareness. It was incredibly surprising that Wildfire did not play her every offensive point with the success she was having on the field. Mei Bruist also managed to create separation when she was on the field, and frequently was their initiating cutter to jump start the offense. In the end, despite the heroics from Elimelech and Mei Bruist, Fury calmly closed out the game against Wildfire 15-8. The San Diegan women played beyond anyone’s expectations but have some room to grow if they want to find their way to semis. In the closest game we saw during quarters, Scandal almost staged a comeback over Riot, before the Seattle team reminded everyone that they were world champions and finished the game with a masterful display of their offense. It didn’t take long for Riot to start rolling. After surprisingly giving up a break to start the game, Riot went off to the races and stole five straight points to go up 5-1. Seattle was in full kill mode, and left no room for Scandal to get back into the point if they made a mistake. Neither team ever made a collection of errors at any given point but, that was because Riot was so efficient off the turn. 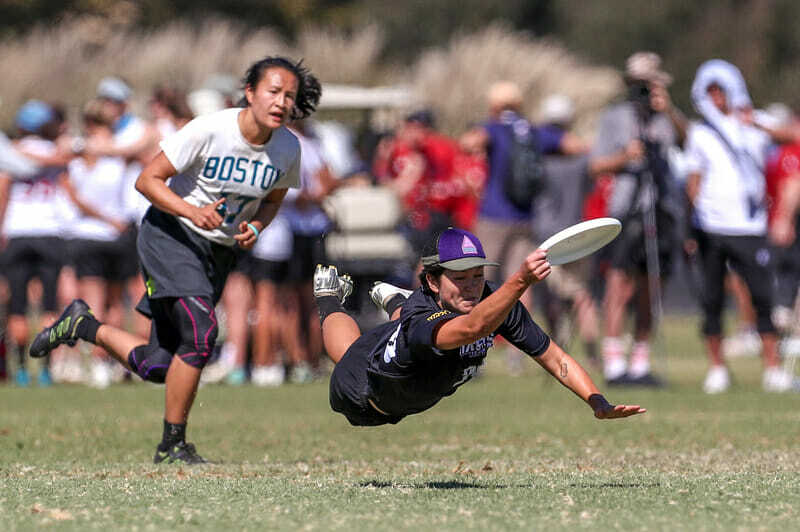 Scandal righted the ship with some hustle from players like Nada Tramonte and Series addition Katey Forth, who helped power through some points to give Scandal a little more of an edge when they were on the field. Before too long, DC started trading points with Riot. This was to their detriment, though. Trading points meant allowing Riot to get comfortable with their four break lead and they ended the half 8-4. The second half saw Riot a little too comfortable, which gave Scandal a chance to play back into the game. After leading 10-4, Riot seemed to take their foot off the gas pedal for a short stint, and Scandal took every opportunity they could to earn a break. Some strong defensive pressure from players like Lisa Kowalski and Lindsay Soo helped DC get three straight breaks to make it 10-8. This was enough to awaken Riot from their stupor. The team knew they could not allow Scandal to gain a foothold with so much on the line. Between Claire Trop, Kelly Johnson, and Qxhna Titcomb, Riot reasserted themselves in a major way. Scandal’s three break comeback was met with two breaks from Riot that all but secured them the win. The DC women continued to fight, but the game was pretty well decided at that point. With a final score of 14-11, Riot banished the demons that haunted them from last year. A win over Fury in semis would go a step further than that, as Fury has successfully knocked Riot out of title contention six times in the past decade. While many had hoped Ozone could cause a little chaos in quarterfinals and upset a top-four team, ultimately they could not repeat the magic of last year’s performance. Molly Brown took no prisoners in the quest to make semis and handily beat Ozone, who was unfortunate enough to be in their warpath. Denver’s conquest began on the very first point, where their offense made short work of Ozone’s zone defense and hyped the sideline into a frenzy. Molly Brown’s D-line used that energy to take advantage of an OB huck from Katherine Wooten. Alika Johnston received the pass off the sideline and powered off a backhand huck to Allysha Dixon for the first break of the game. It wouldn’t be the last. At 4-2, Molly Brown forced a number of turns and exhausted Ozone’s O-line enough to sneak a pass through to Maggie Chen for the break. Until that point, Ozone had been able to set the tone when they were on offense, but the marathon point caused their cracks to show and, a few points later, they allowed two more breaks. Molly Brown took half 8-3 with especially strong showings from Johnston and Manuela Cardenas. Ozone were able to recollect themselves during half, and played clinical offense down the stretch. Maddy Frey alone seemed like she was going to be able to play them back into the game. Whenever Ozone needed a big play, Frey was there to be an outlet for them. Denver tried a number of different defensive looks to stop Frey, but she generally found her way open when Ozone’s handlers looked her way. Even with Frey’s heroics on offense, Ozone’s true problem was an inability to draw a mistake out of the Molly Brown offense. 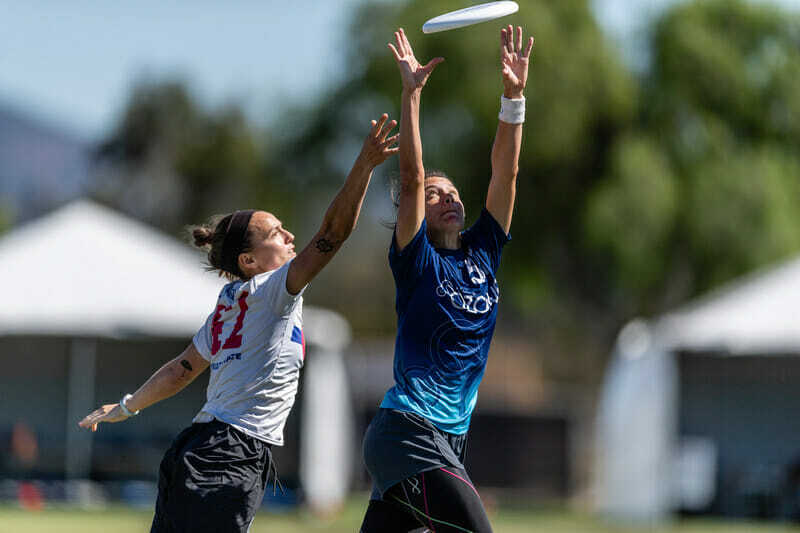 The Denver women were disciplined and precise with their cuts, often opening up huge swathes of the field for players like Liza Minor and Lisa Pitcaithley to get massive gains on under cuts. Lisi Lohre was also a menace downfield, often collecting hucks with her defender trailing far behind. By the end of the game, Molly Brown’s offense had loosened a little, but not enough that Ozone could play their way back into contention. Denver finished them off with an easy around backhand to Dixon and advanced to their fourth consecutive semifinal appearance. Comments on "Club Championships 2018: Quarterfinals Roundup (Women’s)"